Today we decided to do a tour round on the way to San Felipe, roughly following what I call ‘Greta’s Sunday Drive’. We crossed the Salinas where our first birds were the usual species including Greater Flamingo as well as a couple of Great White Egrets, lots of Shelduck and a nice group of Great Crested Grebes. Our next stop was along the pallet road where we added Kestrel, Hoopoe and Collared Dove to the list. Moving on to the Monastery road we found Green Woodpecker, Little Owl, Southern Grey Shrike and four Buzzards flying .At the palm farm track we saw another Little Owl and a couple of Marsh Harriers were flying around. A small bird in the reeds was eventually identified as a Reed Bunting. Turning into green sandpiper alley a Grey Heron was standing in the road and a Kestrel and three flying Buzzards were also seen. We continued our route past the sheep sheds and on to Lo Chicharra/Santa Agueda where Black winged Stilts, Reed Buntings, a Green Sandpiper and lots of Crag Martins were seen. After a coffee stop in San Felipe, we arrived at the El Hondo Visitor Centre and had a quick sandwich before going for a walk round. Several Purple Swamphens were in evidence along with plenty of Chiffchaffs and Stonechats. 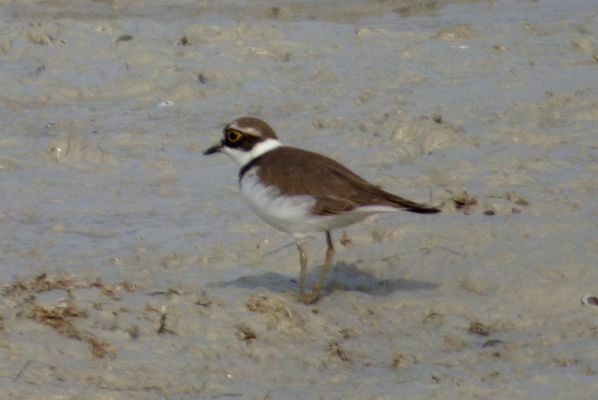 The first hide was interesting as there was little water but a layer of mud had attracted a few good species, including Little Stint, Dunlin, Lapwing, Ringed Plover and even a Little Ringed Plover, usually a Summer species. We carried on to the second hide where there were numerous Shelducks and a few Little Grebes. 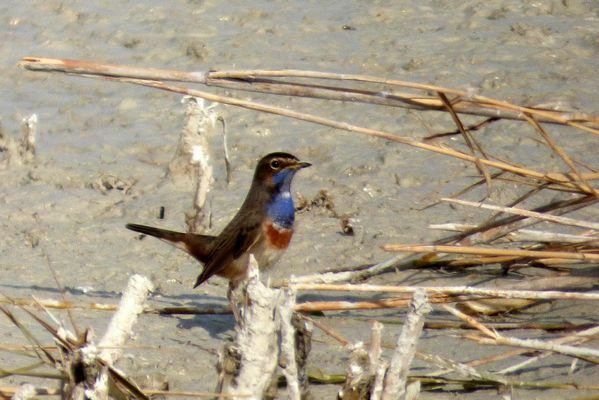 As we left a small bird attracted our attention, finally a Bluethroat for me after missing out on three already this week! We headed back to the first hide where the waders were joined by a Common Snipe and, amazingly we saw up to six Bluethroats! Two were in the reeds on the far side of the lake with others appearing from the reedbeds on either side of the hide. 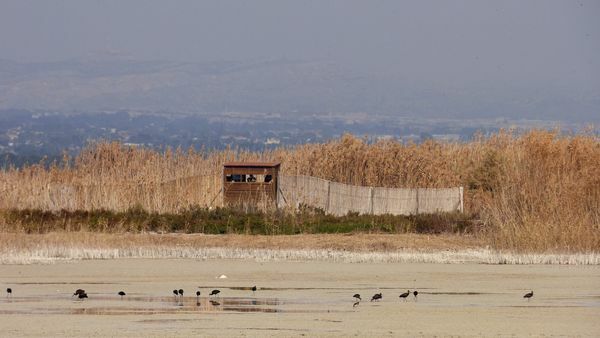 While we sat there a large group of Glossy Ibis flew over with a few landing in front of the hide. We headed back round the boardwalk to the car park and drove back through the countryside, seeing more groups of Glossy Ibis flying and several more repeats of species already seen. It had been a great day’s birding. Species list – Great Crested Grebe, Little Grebe, Cormorant, Great White Egret, Little Egret, Cattle Egret, Grey Heron, Greater Flamingo, Glossy Ibis, Shelduck, Mallard, Marsh Harrier, Buzzard, Kestrel, Coot, Crested Coot, Purple Swamphen, Moorhen, Black winged Stilt, Avocet, Ringed Plover, Little Ringed Plover, Little Stint, Dunlin, Green Sandpiper, Lapwing, Snipe, Slender billed Gull, Audoin’s Gull, Yellow legged Gull, Collared Dove, Little Owl, Hoopoe, Green Woodpecker, Crag Martin, Water Pipit, White Wagtail, Robin, Bluethroat, Black Redstart, Stonechat, Blackbird, Chiffchaff, Sardinian Warbler, Southern Grey Shrike, Spotless Starling, Magpie, House Sparrow, Serin, Goldfinch, Reed Bunting.